If something bothers you, change it. Jerry Seinfeld did. It feels like I was the only one that didn’t watch Seinfeld in the ’90s. I certainly knew the show existed, but never really tuned in. Recently, though, I read an interview with Jerry Seinfeld where he spoke about the inspiration for his new show, Comedians In Cars Getting Coffee. It’s very important to know what you don’t like. A big part of innovation is saying, “You know what I’m really sick of?” For me, that was talk shows where music plays, somebody walks out to a desk, shakes hands with the host, and sits down. “How are you?” “You look great.” I’m also sick of people who are really there to sell their show or product. “What am I really sick of?” is where innovation begins. I bolded that last part because that’s the key to this entire concept. Seinfeld has obviously spent some time around the talk show format. He made a big name for himself by going on late night talk shows with his comedy. He won the hearts of millions and over the years he spent more time on the shows promoting his various projects. But through it all it appears that while he certainly liked certain aspects that other things frustrated him. He wanted to get comedians in a different setting. He wanted to get them moving and riding in the car. He wanted to see if he could get some better conversation by sitting in coffee shops and taping for half a day and editing instead of just doing it live for 5-10 minutes. He had some good ideas. But he probably didn’t know if they were good ideas at the time. He knew he was frustrated by the status quo and he wanted to try something different. And it seems to have been working for him. The show is popular and seems to be breaking new ground. So the question for you is: What frustrates you? It’s easy to complain. Most of us do it everyday. We’re kind of programmed to get annoyed by things, but what most of us don’t do is take those complaints and use them as opportunities. I’ve noticed that most of the time when I’m frustrated and annoyed that I don’t even really pay attention to the moment. I just complain for a bit and then move on. Then I do the same thing the next day or the next time it happens. For example, maybe it’s sending the same email response 3x a week. It frustrates me to send the same message that many times each week or whatever. I do it and do it and repeat and repeat. I don’t take action. But that’s an opportunity. If I note the complaint or the thing that annoys me I can look at the issue and figure out how to find a solution. The habit you want to get into is noticing the things you complain about and taking note of them. Now you have a list of opportunities not just to make your life more enjoyable, but possibly to improve your business or to create new business opportunities. Everything could present an opportunity. 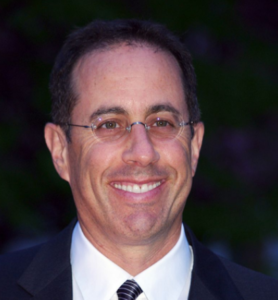 Jerry Seinfeld was annoyed by something that was pretty big: talk shows. That’s an established industry. And the format is pretty much the same on all the shows. When things are really set in stone and are industrywide then you really have an opportunity to shake things up. A recent innovation that came from just a little annoyance is Slack, the messaging software. The founder was working on a gaming company and seemed to not like emailing back and forth with his team or with those playing the games or something like that. So he created a way for everyone to keep an ongoing dialog in a chat form. Just a small annoyance, but now the software has been adopted by a number of businesses and organizations. A little annoyance became a big opportunity. Now we’re taking things to another level. How many times do people complain to you? Not necessarily something that you’ve done to them or anything like that. Just times when they want to blow off some steam and get something off their mind. In the blogging world we like to focus on questions people are asking. We figure that if one person is asking a question then the odds are good that many people are asking the same question. If we can provide an answer in the form of a blog post then that blog post has a very good chance of being useful to those people asking the question. The same thing is true with complaints. If one person has a complaint about something then the odds are good that many people have the same complaint. And that’s where you have an opportunity to change things. Opportunity is all around us. Seinfeld is right in thinking that innovation often begins where you think to yourself that you’re sick of something. He was sick of talk shows. He didn’t like them. The format bothered him. But he did something that most people don’t do… He created his own format for a new talk show. Start taking notes of the things that bother you. Also begin paying attention to what others complain about. It doesn’t matter if it’s a big thing or a small thing. Any frustration could become a big opportunity. Not everything will, but you only need one thing to work to make something really cool. When you notice complaints, your own or those of others, you’re probably hitting on something that many people are dealing with. If one person is having an issue then the odds are really good that many are having the same issue. If you train your brain to pay attention you’ll be in a great position to change things.